Travel to Morocco and visit the best of the country's attractions. Travel from the snowcapped Atlas Mountains to the endless sands of the Sahara - from the medieval old town of Fes to the spice markets of Marrakech: the rich history and natural beauty of Morocco awaits! Morocco is a visual feast of a lifetime, and one of the most intoxicating countries in the world. You will experience the shifting sands of the Sahara Desert, magical nights under the stars, the workings of a tannery and dye pit in Fez, impressive imperial cities with lively medieval-like markets, and labyrinthine medinas. Home to magical imagery around every turn, you are destined to have lasting impressions of Morocco’s rich history, striking landscapes in the desert, colorful cities and fascinating people. 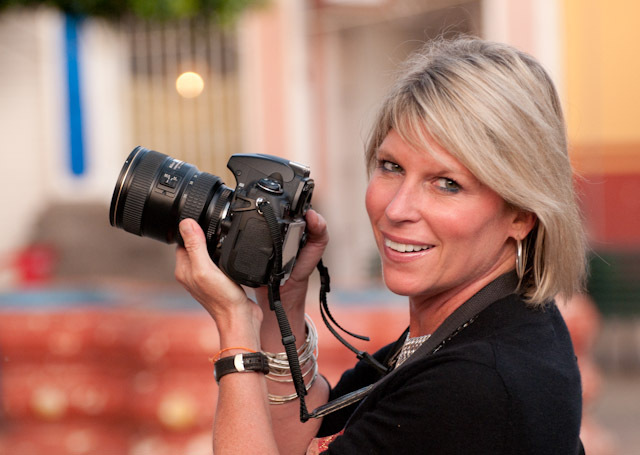 Join us in Morocco on this amazing Photo Quest led by Alison Wright. Photograph the many shades of blue in the artsy city Chefchaouen. Photograph the famous Djemaa el-Fna Square in Marakesh, perhaps the greatest open-air spectacle in the world, with is food vendors, acrobats, snake charmers and musicians. Photograph tanners dying animal skins in hundreds of vats from a rooftop in Fez. Hike and photograph the peaceful trails of the High Atlas Mountains for beautiful views of the nearby traditional Berber villages. Enjoy private photo shoots with Berbers of the desert in their traditional garb, and sunrise and sunsets of the Sahara. Take portraits of traditional Berber families. Experience a luxury tented desert camp for one night with dinner under a star-filled Saharan sky and Berber folk music around the campfire. Early morning camel ride across the Sahara dunes as the rising sun slowly transforms the landscape from pink to gold. Photograph the dramatic Dades Gorge, a deep fault in the High Atlas, and the famed mud-brick turreted fortress of Ait Ben Haddou, a 16th century ksar (fortified village) now protected as a World Heritage Site. Depart on an overnight flight from the USA to Casablanca. Arrival in Casablanca, Most flights arrive from LAX and JFK on Airfrance or Delta via CDG at 2:35 pm at CMN. We depart by 5pm from Casablanca to Rabat ( 1 hour drive) and stay in Rabat tonight. Book your flights to arrive before 5pm. If you need to fly in one day earlier, we can set up an extra night in Casablanca for you. After breakfast depart for Chefchaouen (4 hours) with a stop in the city of Tetouan. All the neighborhoods of Tetouan belong to three different architectural styles: The Andalusian style (Medina), the Spanish style of the early and mid-twentieth century (Ensanche) and the after independence style (peripheral neighborhoods). After the tour in Tetouan, continue the drive to the blue Chefchaouen. In the afternoon photograph the Outa-el-Hammam square, the cobblestoned medina and the Tarik-Ben-Ziad mosque whose octagonal minaret is inspired by that of the Torre de Oro in Seville. After dinner, we will do a night shoot. Overnight Chefchaouen. After breakfast, you will have a tour of this “cool” blue town, tucked away in the mountains. You will enjoy the relaxed atmosphere of the Rif Mountains. Perfect for photography, this blue city offers every shade of blue. As you wander the streets of “Chaouen,” you’ll find ample opportunities to capture the vibrant colors and textures of this wonderful town. We’ll have an early dinner and afterward, will take a walk up onto the surrounding mountainside where you can photograph this whitewashed town nestled in the hills at dusk. Overnight Chefchaouen. After breakfast, you will head towards Fez (4 hours) , the cultural and spiritual capital of Morocco. Upon arrival in Fez, you will begin your guided tour to the Medina, a perfect introduction for your trip in Morocco. Fez’s renowned walled medina is one of the most perfectly preserved medieval cities in the world, full of visual delights. Enter through one of its four arched gates and discover a mile-long network of souks, open-air cafes, courtyards, hammams (traditional steam baths), and gardens. Photograph the UNESCO site University of Al Quaraouiyyne, the El-Attarine and Bou Inania Medusas and Galawi Palace.Photograph the sunset from a viewpoint overlooking the city. Overnight in Fez. Early morning shoot to capture the tanners who soak skins in vats of dye. We photograph the famous tanneries, to witness leather skins being cured and dyed in hundreds of enormous, colorful vats. Spend the day photographing this impressive imperial city. At the 14th-century Bou Inania madrassa, photograph intricately carved stucco walls, arches, and cornices and visit the Kairaouine Mosque. Explore and photograph the vibrant medina, where merchants preside over colorful mounds of spices. Later, visit the Royal Palace and Fes Jdid, home to the historic Jewish quarter. Afternoon free to explore Fez on your own. Overnight in Fez. Enjoy a real Lawrence of Arabia moment this morning with a sunrise camel ride across the desert on the return journey to the auberge. Then drive to Todra Gorge (approximately 3.5 hours), a massive trench that rises over 250 metres to form one of the most dramatic and spectacular natural sights in Morocco. Before the town fully awakens, we walk up Ait Benhaddou in the early morning light. In actuality, this setting has been used for more films than any other location in Morocco including; Lawrence of Arabia, Jesus of Nazareth, and more recently The Gladiator. From there we will head off towards Marrakech over the High Atlas Mountains, with a stop to see an Argan co-op where the ladies make this sought after oil. Check into the hotel and then head out to the famous Djemaa el-Fna square for sunset from the rooftop. The Djemma el Fna Square -Morocco’s UNESCO-recognized platform for halqa (street theatre) where snake charmers, magicians, dancers entertain daily. Get a hanna tattoo from the locals or a traditional tea as we photograph the sunset from our balcony overlooking the vast square. Overnight Marrakech. Transfer to Casablanca Airport (3 hours drive) in time for your flight home taking with you some certainly incredible memories of our land so full of remarkable contrasts and very friendly people. Book your flights after noon from Casablanca back home. $5900 based on double occupancy. A single supplement is available for an additional $1450. The single supplement is available in all destinations with the exception of the Sahara Camp.